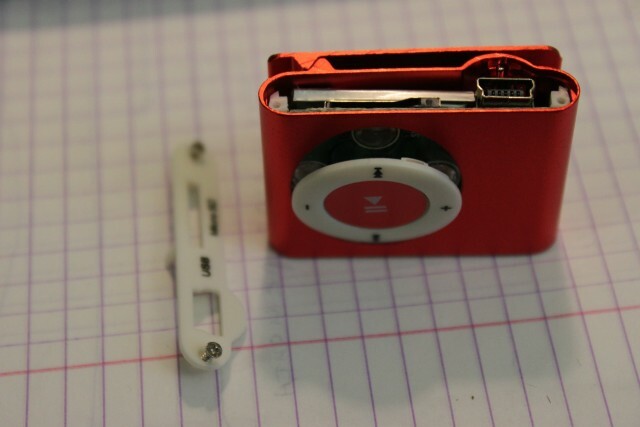 This story is about ultra low-cost Chinese mp3 player. It looks like iPod shuffle, but costs about 1$-2$. Its usual name on Aliexpress looks like: Mini Clip Mp3 Player Portable Music With Micro TF Card Slot (MP3 ONLY) Can Use As USB Flash Dish Up To 8GB Support. 1) Support MP3/WMA audio formats. 7) Main colors : Black, Silver, Green, Red,blue. The player’s button was installed not quite symmetric. 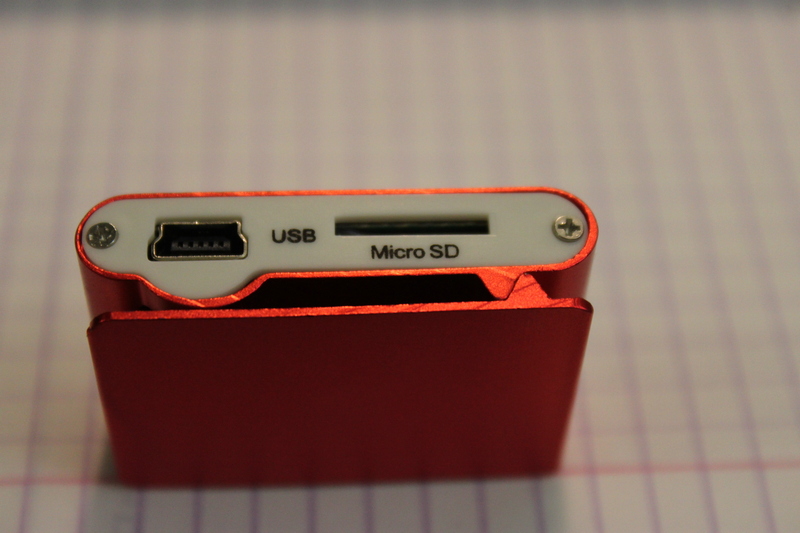 From the top side are USB connector and microSD card slot. From the bottom side are power switch and audio jack 3.5. It’s amazing! Inside there is only one chip GPD2806C-004A, two resistors, a zener, connectors, 5 buttons and that is all! 1) Chip has microSD interface connector with hot-plug features. 2) mp3 playing back from SD card. 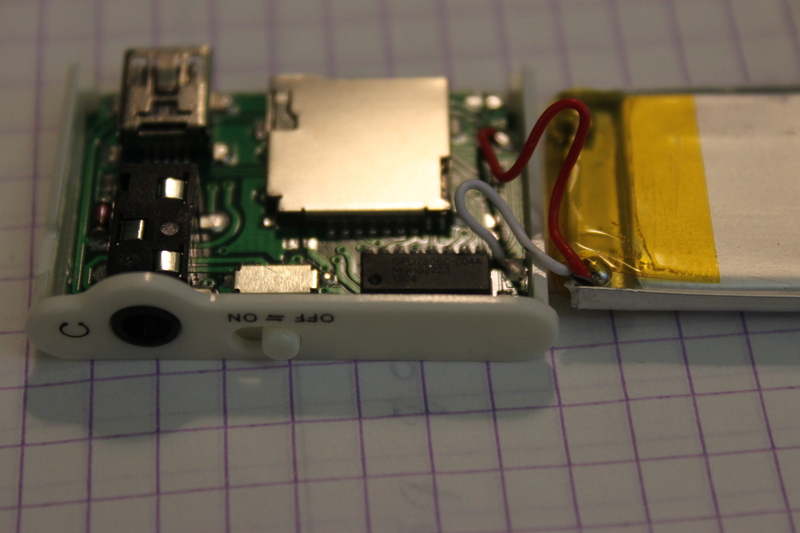 3) Chip works like card-reader via USB. 4) No external oscillator or quartz needed. 5) There is an opportunity to work with external FM-receiver (AR1019) or external EEPROM via I2C bus. 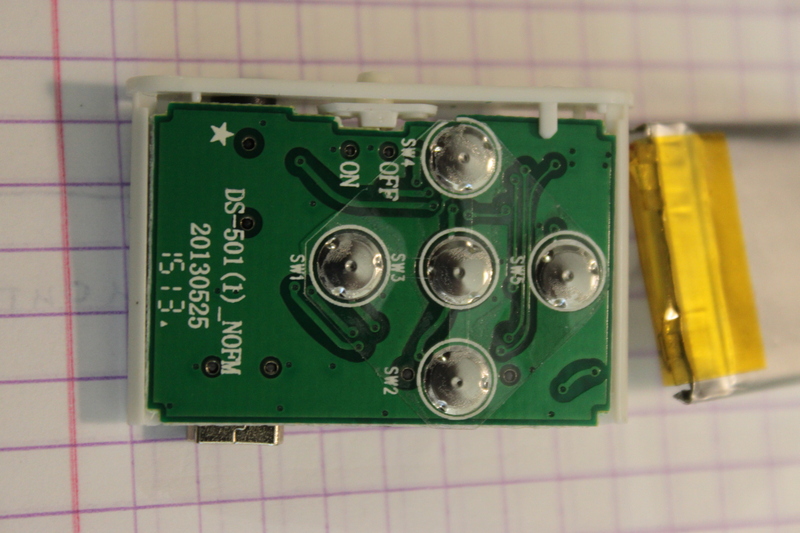 6) Automatic determination of existing FM-receiver or external EEPROM on PCB. 7) Up to three GPIO avaliable for control buttons. I made tests of work in card-reader mode. The maximum speed of reading and writing with microSD Kinston 10 class is 890 and 795 KiloByte per sec.In fast this is the equivalent to the USB 1.0 specification. Battery has no marking identifications. But it is found on Ali like PL402223 – LiPol battery 55 mAh. 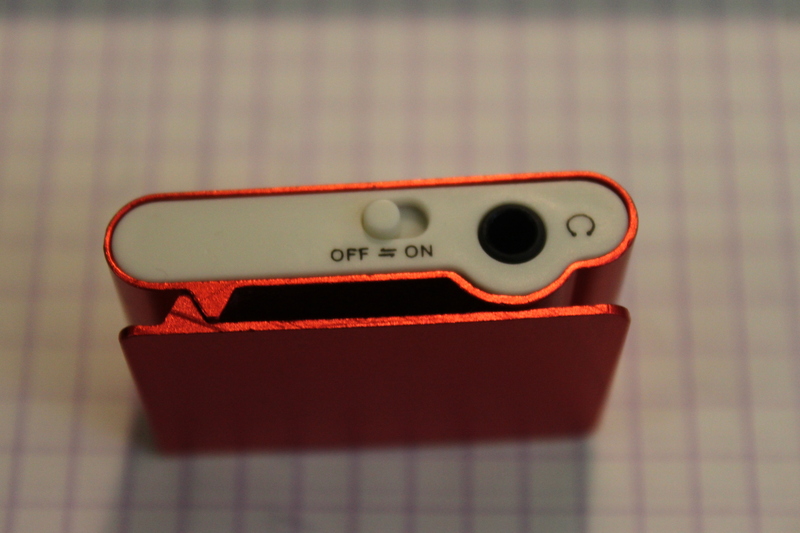 You can note (using the previous photos) that battery doesn’t have a charging controler. Main PCB doesn’t have any charging controllers too. That’s why you should be very careful with charging process! It will be so easy to damage the battery if it is the overcharged! Imho, the quality of sound is good, and player works fine like any other mp3 player. As a conclusion. 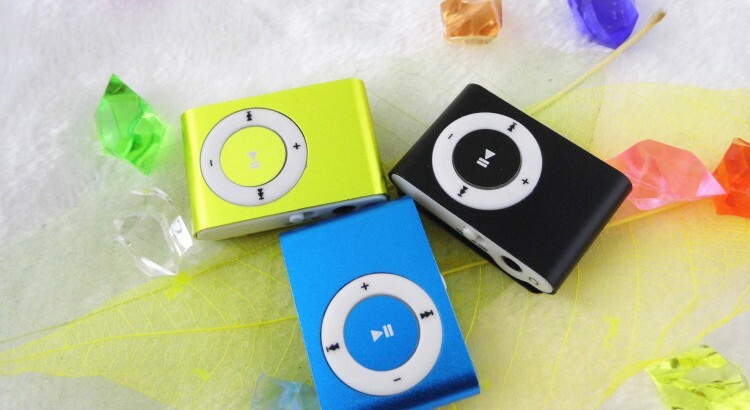 It is mp3 player at a Low price by only 1$. Be careful! Do not charge it for more than 2 hours from PC USB port. I´m Carlos I just have a question about this article, I’ve heard that MP3 player cuold receive FM signal if you press a combination of buttoms, I’m no sure but I would like to know about it. Thank you for interest to my article! This MP3 player have no FM module supporting. 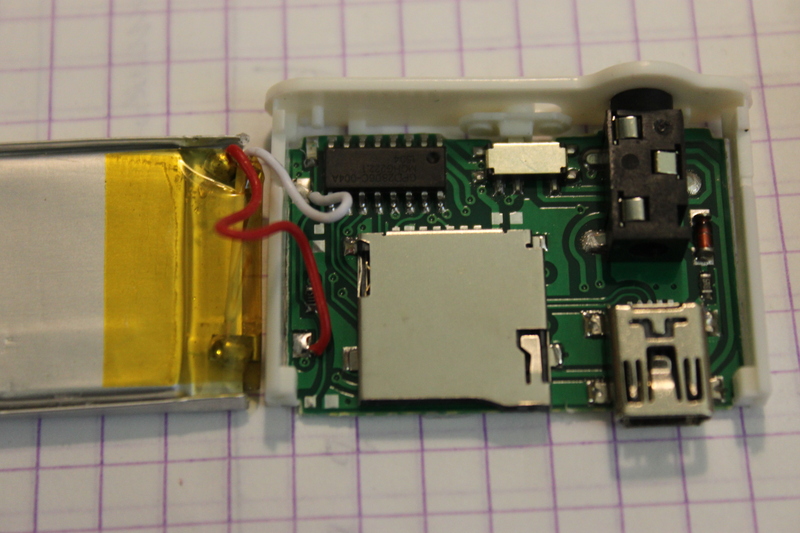 But it is quite possible that exist some other similar models with FM, because the main chip (GPD2806C-004A) of this MP3 player have support to work with external FM modules. 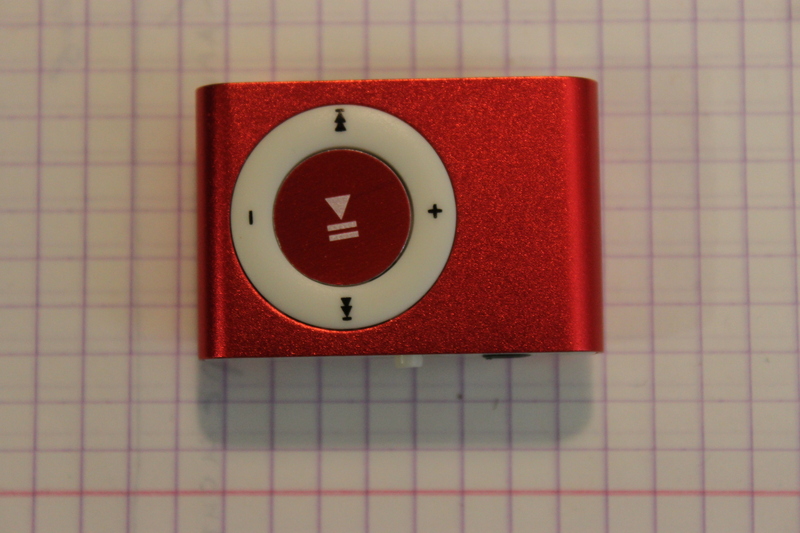 Hi, A friend of mine bought a cheap mp3 player just like this one, he charged it for about 8 hours. Now it plays one song and then it turns off by itself…is the battery damaged? or is it something else? Hi! I think yes, the battery is damaged. 8 hours is the extremely long time of charging for this battery. It is possible to buy new battery (it’s type – PL402223 – LiPol battery 55 mAh) and repaired the player. But I think to buy a new player will be cheaper and easier than new battery for this one. Excuse me, how about voltage of it’s battery? Can be replace? It has a standard voltage 3.7V, and can be replaced by the any similar LiPo battery. so i have a couple questions. for replacing the battery could i buy another battery that wasnt 55 mah? perhaps 150 mah or even 500 mah? also what voltage would the battery have to be if i did want to replace it ? I buy these things all the time for little DIY projects. But the problem I’ve noticed is that if you play a song at its max volume, then switch the mp3 off then on again, the sound decreases. What Im trying to do is have it play at max volume, even after turning it off and on again WITHOUT having to do it manually. how can i turn on the shuffle mode? Please don’t lie, it is not iPOD shuffle clone. my daughter bought one and we cant seem to get it to charge. 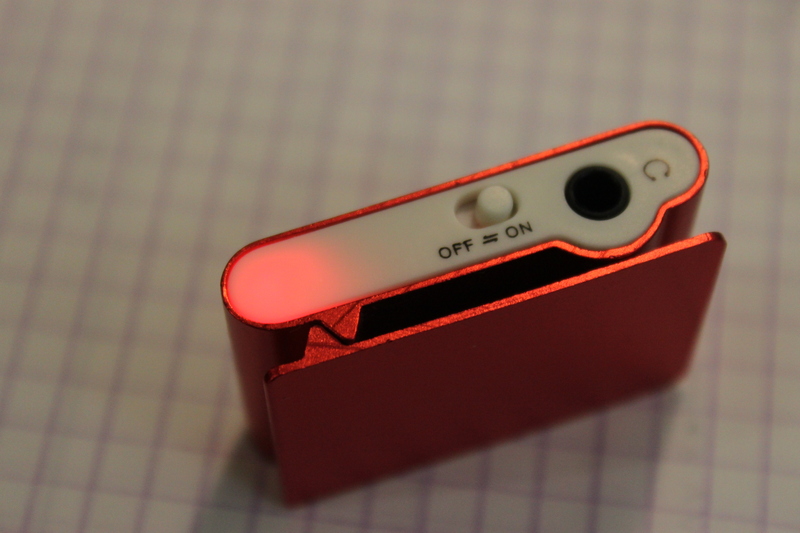 the red light does not come on when charging and then blinks when it is turned on. Is this normal? No. It’s looks like there no current comes to battery. Please check USB cable and mini USB connector on player. Thanks for all the info Tarkus! Just ripped into one after doing the same thing PICFREE’s friend did by letting the battery charge too long. The chip label brought me here. This one has a different case style, but the PCB looks identical. I’m not sure if I killed it, or if it had a dud battery from the start. I notice aliexpress’ info for that battery states “built-in protection board, overcharge and over -discharge protection”. I used a similar player with an LCD for about a year with no charging issues, but I’ll be more careful from now on. I typically just leave them on a USB wall charger for a few hours. Wish you could buy a bag full of those batteries for a couple dollars. The players only sell for a dollar and something. I got one of these MP3 players and my computer won’t recognize the usb connection. When I hit the play button the red light comes on for about 20 seconds, blinks and goes off. I can’t download anything to it, because my computer doesn’t recognize it. I guess I just got “ripped off” thinking I was getting a good deal on an Apple iPod Sufffle. Hey, I have 2 of them that don’t work, but when it worked briefly, the only way to add songs is directly to the micro sd card, make sure they are all MP3 files. I used mine 1 time each & charged it a few hours and now they both dont work. So I bought a real Ipod shuffle. I need it for working out & can’t do without music. Hi. I recently bought an MP3 player like this. Like most other people, I am experiencing problems charging it. When I try to listen to music, it “pauses” the music after around 10 seconds of playback, and this keeps repeating even after charging it for a couple of hours. However, whenever I plug it into the charger and try to listen to music, it doesn’t turn off and I am able to use it without any problems. So, the current is coming through, but it’s not charging. What would you recommend doing? Thanks in advance. Probably the same thing that many of us were having with these things. The batteries must be coming from the same people that brought us all those wonderful capacitors a few years back. Neither of the two I got recently which look like the one above lasted long at all, nor did the one with the LCD which was identical to one I had much better luck with. That one acts sort of like yours, and will stop and power down immediately *after* a song. I can sometimes get it to power back up and play, but I suspect the battery is running on fumes at that point. The downside to that one is that it can only play music with the power switch “on”, and if the switch comes on any time there’s anything connected to the USB port, it goes into “transfer mode” and you can’t use it as a player, so I can’t just use it under USB power. FWIW- I was relatively careful on this recent batch (three players) about leaving them charging too long, so I’m guessing if you’ve got one of the dud batteries, you might be doomed either way. 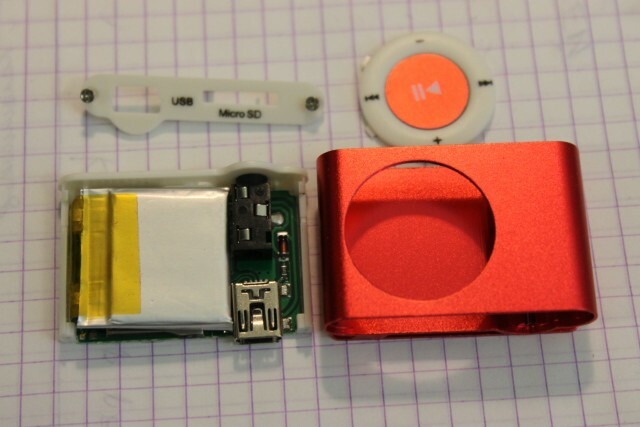 can you change the battery from the original iPod shuffle (4th generation) to the Chinese ripoff ? Hi, I just discovered that when I plug this player in my Windows 7 laptop all audio is gone. I realized that the mains interruptor was on the “ON” position and out of a whim I decided to conect my headphones to it. And guess what? There was audio coming out from the jack. I kept playing with it and it turns out that the buttons control my media player. After more testing, I came to the conclusion that the player works as a DAC with control capabilities. I’ve use it with Foobar2000 and Jriver Media Center. And the sound is great with some issues of background noise and clicks from the hard drive. Not bad for a dollar, I guess. Wow! Very interesting! Thank you so much Carlos for this information! Hi, my dad has one of these and it does have FM function and now we can’t get it back to MP3 can anyone help??? I replace the SD card and don`t have the driver for it to play the music is there a way to get the driver for this device?